Star formation not only determines the observed properties of galaxies, but also significantly influences galaxy evolution. What drives star formation in galaxies? There is little consensus to this apparently simple question. Theoretical studies have demonstrated that once self-gravitating objects (cloud cores) form from molecular clouds, the gravitational collapses of cores lead to star formation at high rate. However, star formation is known to occur in a very slow rate in galaxies (e.g., Zuckerman & Evans 1974). It remains uncertain what make star formation inefficient. There are several processes discussed to slow down and regulate star formation, e.g., stellar feedback, magnetic field, cloud turbulence, and so on. However, it remains to be characterized observationally how these processes influence cloud structure and star formation. 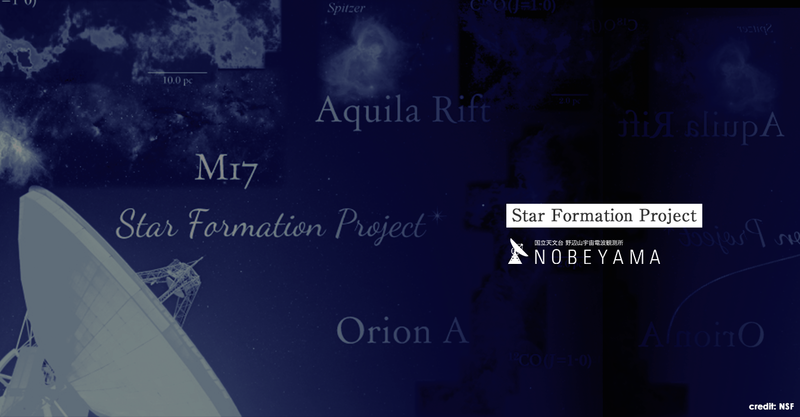 Toward a full understanding of star formation in Milky Way, we aim at characterizing the cloud structure and physical conditions of molecular clouds by means of wide-field mapping observations of nearby molecular clouds, Orion A (400 pc), Aquila Rift (400 pc), and M17 (2000 pc) using 12CO (J=1-0), 13CO (J=1-0), C18O (J=1-0), and N2H+ (J=1-0). Copyright © 2018 Star Formation. All Rights Reserved.